Papas Rellenas is basically stuffed potato, where you mold mashed potato around a stuffing that is often made up of seasoned meat, olives, raisins and egg. The hilarious part about the Papas Rellenas (to me, anyway), is that you basically form it to look like a potato! After it’s fried, it almost just looks like a potato. HILARIOUS! Unfortunately, I didn’t get a good picture of a whole one. I was too focused on trying to show the inside. One of the unexpected highlights of this challenge was actually the condiment that we prepared to serve with the papas, called Salsa Criolla. On paper, it doesn’t look that interesting, and initially I was tempted to skip it. It’s basically just marinated, thinly sliced red onion. Reading some of the early feedback on the challenge changed my mind, however, as people described how much they loved the stuff. They were so right! The onion mellowed out by the marinade, and it was the perfect accompaniment to the dish. I will definitely be making this in the summer to go with some nice grilled fish. Yum!! The least successful part of the challenge, for me, was the ceviche. I kind of wussed out on it… I’ve had lots of different kinds of ceviche before, and usually really like it. I even made it once, a long time ago. This time, I thought I’d make it a simple side dish for the meal, and just did some thinly sliced scallop. It was just OK. Really, it wasn’t terrible, but I think I was expecting to like it more than I did (because I love scallop). That, and I was really happy with the way the other dishes turned out, so I think they outshined my rather dull attempt at ceviche. I’ll try it again in the summer, and next time I’ll do it with more gusto. But first… I think I’ll try making a baked version of the papas. I’m not so keen on frying things, so I need to adapt this dish if I’m going to make it more regularly. I know I won’t get the same kind of crispness on the outside of the papas just with baking, but it’s worth a shot! Based on a recipe provided by Kalthyn, from Bake Like a Ninja – adapted from a home recipe by her Spanish teacher Mayra. Boil the potatoes until they pierce easily with a fork. Remove them from the water and set aside to cool. In a sautée pan, heat up 1 teaspoon of oil and cook the onion and garlic until browned. Sauté the pepper until softened. Mix in the hydrated TVP, cumin, paprika, raisins (if using). Deglaze the pan with the wine/water/stock. Add in the olives and cook for a couple of minutes. If the potatoes aren’t too hot, gently grate, rice or mash them into a large bowl. Mix in the egg, salt and pepper and knead well. Once the filling has cooled enough, you can form the papas. Use three small bowls to prepare the papas: combine flour, cayenne and salt in the first; a beaten egg with a tiny bit of water in the second; bread crumbs in the third. Divide the potato “dough” into 6 equal portions. Flour your hands, to help prevent sticking and form one portion into a round pancake across the palm of your hand. Make an indentation in the palm area, to add the filling. Spoon in about 2 tablespoons of filling into the palm of your hand. 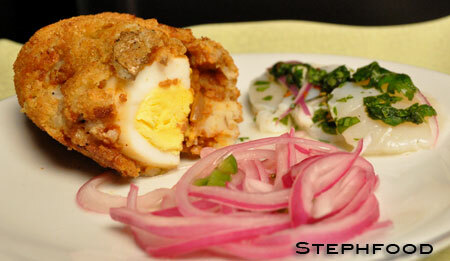 Gently press a halved hard boiled egg into the centre of the filling, cut side up, until it is flush with the filling. Gently fold the potato closed around the filling, forming it into a potato-like shape. Repeat until all 6 have been shaped. Heat 1 ½ – 2 inches of oil in a pan to about 350 – 375° F (175 – 190°C). Carefully dip each papa in the three bowls to coat: first roll in flour, then dip in egg, then roll in bread crumbs. Fry the papas about 2-3 minutes until golden brown. I found that carefully rolling the papas while frying helped to ensure even frying, and kept the potato-like shape. Drain on paper towel and store in a warmed oven if not eating right away (or while frying up the rest of the papas, if making batches). Serve with salsa criolla, and eat as soon as possible. Wash and trim the scallops and slice them ½ inch thick. Place scallops and onion in a glass bowl and sprinkle with salt and pepper. Combine lime juice, chili pepper, cilantro and garlic and pour over the scallops. Gently stir the mixture, exposing the scallops to the juice. Let it “cook” for 30 minutes. Serve with a slotted spoon, to drain off most of the juice. Sorry to hear your ceviche didn’t come out as well as you’d hoped. Perhaps another try at another time will produce something better. I totally agree that the salsa criolla was a highlight to the whole thing. So simple and easy, but makes a huge impact on how great the papas are with it. I can imagine using it for so many other dishes too! Man, reading your post makes me sad that I skipped the salsa criolla. I may just make some this week, hearing how much you loved it. 🙂 You really did a great job on the challenge. Sorry your ceviche didn’t turn out as fabulous as you’d hoped, but everything looks wonderful. Great job! What a beautiful plate you created. The papas got a great color to them. I agree, though, about wanting to try a baked version. I am sorry the ceviche didn’t turn out as you had hoped, but I am glad that the salsa criolla made up for some of that!! Too bad your ceviche didn’t turn out the way you had expected it to! I really loved it but I guess maybe not all fish are equally suited for it.. 🙂 Your papas looks delicious though and I really wished I had made those too! I can always do that later ofcourse!! Good looking plate. I know what you mean about the ceviche when you cooking something without putting your heart into it, it is just never the same. That is what happened to me on last months challenge, probably more of a summer dish anyway. your papas look so yummy! 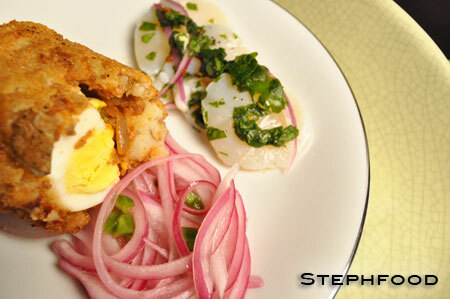 A long time ago I put together a soft yolk scotch egg for a cooking challenge. How good would it be to fork into one of these papas rellenas and have a rich egg yolk spill out? @Robert: You are so right!! I would totally love that… I should try it.